It was an old photo reused to make new fake news, said Atty. Burce Rivera, former professor at the San Beda College, when a photo which featured incumbent government leaders on a plane and watching the fight of Senator Manny Pacquiao. The photo included several government officials including President Rodrigo Duterte himself, watching a boxing match. 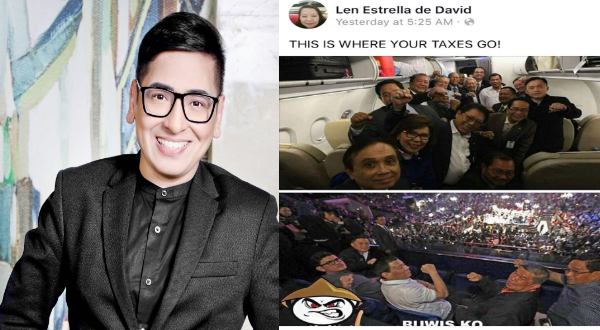 The said photo was shared by a Len Estrella David allegedly repporting taht government officials used Filipinos' taxes to get to the United States of America to watch the fight of Senator-slash-boxer Manny Pacquiao with Lucas Matthysse two days ago. However, Rivera, a known supporter of Duterte said that the photos were taken months ago. Besides the defense he also did his usual attacking of the past administration , his usual tactic when the presentt administration is being criticized. The lawyer said that said admin had spent far more taxes and yet remain unpenalized. "This post got a lot of likes from equally clueless citizens. The picture above was an old photo which was NOT the entourage who went to Malaysia to watch the Pacquiao fight. And to insinuate that it was people's money used to watch the fight illustrates the ignorance and the audacity of people like the one who made this post. Lest they have forgotten, the event was of national importance because an incumbent Senator was the main event, which is something very unique in the world. As President, it was an opportunity to showcase Filipino pride, to meet with PM Mahathir and talk about important matters because perhaps PRD was asking for Mahathir insights on the BBL and the China dilemma. It was taxpayer's money well spent. The President has the duty and obligation to lead his people in times of victory as well as during hard times. Let us not forget that PNoy made seven trips to the United States during his term. In one visit, he took an unscheduled detour to go to a gun store and miss an event of the Filipino community and nobody questioned how the taxes were used for these state visits. So why the hypocrisy now? What about the numerous trips Leni Robredo made all over the world? The pictorial in the Holocaust Museum, the numerous speaking engagements where she bad-mouthed the present administration. It was done during official time and yes, since we are paying her salary, it is taxpayers money. Why is Miss de David not asking where the taxpayers money went and ask for tangible accomplishments of the Office of the Vice President? The only time you have the right to be sarcastic and say "this is where your taxes go" is when you have the moral ascendency to do so. If you have not called out the past administration about the numerous corruption allegations in the MRT deal, DAP, DengVaxia, the health stations fiasco in the DOH and so much more, please spare me the sarcasm. You know where our taxes went? It was lost in the ignorance and hypocrisy of many Fililpinos, many of them are not even taxpayers."